The portrait Dom Sylvester Mooney, Abbot Emeritus, entered the British Museum in 1996 with the artist's portrait drawing of Abbess Mary Imelda of the Trappist Abbey of Glencairn, Ireland, and a drawing of Paris Opéra star dancer Kader Belarbi from Roseman's extensive oeuvre of drawings on the dance at the Paris Opéra. The Deputy Director of the British Museum, Jean Rankine, acknowledging the acquisition of Roseman's drawings on behalf of the Trustees, writes in her cordial letter to the artist: ''At their last meeting the Trustees of the British Museum had before them a report of your gift to the Department of Prints and Drawings of three drawings by yourself: Mother Mary Imelda, Abbess of Glencairn, Ireland (1978); Dom Sylvester Mooney, Abbot Emeritus, Douai Abbey, Reading (1984); and Kader Belarbi, Ballet de l'Opéra de Paris, 'Petrouchka' (1994). Roseman was invited in 1984 to the Benedictine Abbey of Douai, in Upper Woolhampton, Reading, where he drew Abbot Emeritus Dom Sylvester Mooney, whose magnificent portrait, acquired by the British Museum, is presented below, (Fig. 8). Although Dom Sylvester was advanced in years, the erudite, English abbot was lucid of mind and still a vital presence in the Community. He participated in the Divine Office in choir and took his meals with the monks in the refectory. Dom Sylvester spoke highly of Roseman's talents as a draughtsman and the artist's deep understanding of monastic life. In a gracious gesture, the Abbot Emeritus honored Roseman by seating the artist next to him at his table in the refectory. Dom Sylvester, one of the most revered churchmen in Great Britain, was Abbot of Douai for forty years: through the Depression, the Second World War, and the post war years, until his retirement in 1969. When Roseman drew Dom Sylvester, he was ninety-eight years old and the oldest living monk in the Western Church. 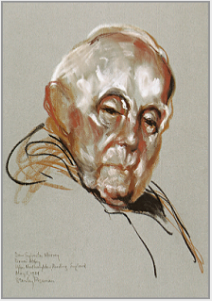 Dom Sylvester invited Roseman to draw him in his room, and over a number of memorable days, the artist drew several portraits of the Abbot Emeritus. "We collected the drawing of Fr Sylvester yesterday afternoon and are delighted with it. Frère Olivier was introduced to Roseman by Dom Jean Prou, the revered Abbot of Solesmes, who was greatly encouraging to the artist in his work from his first sojourn at Solesmes in 1979, kept in correspondence with Roseman and Davis over the years, and graciously welcomed them back on returns to the monastery. Portrait of Frère Olivier in Prayer is drawn with a vibrant, painterly chalk technique in rendering physiognomy and light and shade on the face of the monk, his head upturned and eyes closed. Roseman effectively conveys the fervor of the young man preparing to make a solemn commitment to the monastic life. 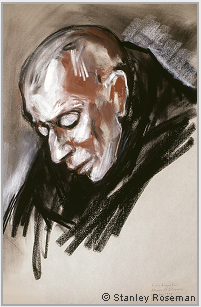 Drawing with a combination of chalks on gray paper, the artist depicts the expressive face of the elderly abbot, with white highlights and warm shading. 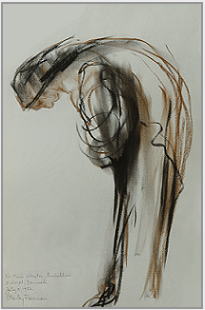 Several strokes of black chalk define the monk's black scapula with hood lowered. Roseman has masterly drawn the head-and-shoulders portrait with an immediacy of lively expression as Dom Sylvester looks directly out at the viewer. On the bottom of this page are links to the other pages on the Monastic Orders. Roseman's work brought him to the Abbey of Fleury in the spring of 1979. The Benedictine abbey was founded in the mid-seventh century along the banks of the Loire. By the ninth century, Fleury was an important spiritual center and place of pilgrimage as the monastery had come to possess the relics of St. Benedict, safeguarded today in the crypt of the Romanesque church. Drawings from Fleury and a photograph of the tower porch of the abbey church are presented on the website page "Ora et Labora, Prayer and Work." of the Romanesque style of architecture. Stanley Roseman began his work on the monastic life in spring of 1978 in a Benedictine monastery, St. Augustine's Abbey, on the coast of Kent, as related on the website page "From the Artist's Memoirs." The historic breadth and geographic scope of the artist's work encompass Benedictine monasteries throughout the British Isles and Continental Europe. Roseman's work includes the Abbey of Subiaco, founded in the Latium region of central Italy in the sixth century by Benedict of Nursia (c.480-547), after whom the Order of St. Benedict, also known as the Benedictine Order, derives its name. The Rule of St. Benedict, a document that gives spiritual counsel and regulations for communal life in a monastery, is the basis of monastic observance in the Western Church. The website page "The Monastic Life," Page 5 - "South to Italy and the Abbey of Subiaco" provides information on the Rule of St. Benedict and relates Roseman's sojourn at Subiaco. Benedictine monks and nuns depicted in Roseman's artwork include abbots, abbesses, priors, and prioresses, and those assigned administrative positions of guestmaster, novice master, bursar, and cellarer. Roseman also drew monks who were teachers in monastery schools, as teaching is a centuries-old Benedictine tradition. The artist drew sacristans, librarians, archivists, organists, choirmasters, bookbinders, tailors, gardeners, and cooks. The Benedictines portrayed in Roseman's work range in age from senior members of a community to young novices and those having taken their first vows in making a first commitment to a contemplative life of prayer, work, and study. 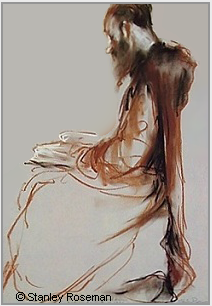 Frère Olivier at the Abbey of Solesmes was preparing to take his final vows when in March 1998 Roseman drew the impressive portrait of the young Frenchman in prayer, (fig. 5). With a painterly use of the chalks and chiaroscuro modeling of light and shade, Roseman has beautifully rendered the face of Don Egidio and conveys a spiritual intensity in this deeply felt portrait of the Abbot of Subiaco, (fig. 2). At the Benedictine convent of Vor Frue Kloster, in Birkerod, Denmark, in the summer of 1982, the Prioress Margarita Schmidt and the Community graciously welcomed Roseman and Davis. 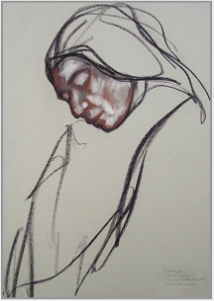 Following their sojourn and in appreciation for the invitation for Roseman to draw at Vor Frue Kloster, the artist and his colleague presented the monastery with the drawing of a nun bowing in prayer as she recites the Gloria Patri at the Divine Office. Presented here, (fig. 11), is the beautiful drawing rendered in a harmony of expressive lines and transparent tones of black and bistre chalks on gray paper. "Surely you are looking forward to have your wonderful 'Bowing Nun.' I hope it (the slide) is as you have expected. "We still remember your nice visit. Really you have opened for us an aspect of our monastic life that can only be given in a drawing having something of life in it, which cannot be explained in words, - a life that God gives. "In monasteries today, a monk or nun makes first, or simple vows, and after three to six years, makes a reaffirmation with final vows in a solemn ceremony in church. Chapter 58 in the Rule of St. Benedict specifies three vows: 'stability,' the vow that binds a monk or nun to a specific monastic community and is unique to the monastic orders; 'reformation of one's life,' that is, embracing the monastic ideal; and 'obedience' to the Rule and to the superior in obedience to God." The website page "Monastic Journey Continued," Page 7 - "Convents in Piedmont and Tuscany" presents a selection of Roseman's drawings of the Camaldolese nuns of Casa Emmaus. The nuns of Emmaus, Casa di Preghiera (House of Prayer), in Tuscany, are members of the Camaldolese Congregation of the Order of St. Benedict, which evolved from the ascetic ideals of the eleventh-century reformer St. Romuald, who founded the Hermitage and Monastery of Camaldoli in the Tuscan-Romagna range of the Apennines. As related on the previous website page, Roseman began the second year of his work on the monastic life at Camaldoli in January of 1979, and he and Davis returned to Camaldoli in the summer of 1998. That summer, the Prioress Mother Domenica invited the artist and his colleague to sojourn at Casa Emmaus so that Roseman would have the opportunity to include Camaldolese nuns in his work. With his drawing book and chalks, Roseman attended the Divine Office with the Community in the chapel, a stone building dating from the eleventh century and situated next to the main house of the monastery. In the chapel, Roseman created a series of excellent drawings of the nuns of Casa Emmaus as they prayed and chanted the Psalms. Psalmody, the singing or chanting of the Psalms, is the foundation of the Divine Office, the daily round of prayer that is central to the monastic life. At Casa Emmaus, Roseman and Davis were given accommodations in the guesthouse, a modest, two-storied stone dwelling with a nicely furnished living room and modern kitchen on the ground floor. The two Americans were the only guests that week in early September. On behalf of the Community, Sister Paola thoughtfully brought her two guests fresh fruit and vegetables from the monastery garden, which she cultivated. On the day before Roseman and Davis departed the monastery, Mother Domenica cordially invited them to join the Community in the refectory at noon for dinner. Sister Francesca, who cooked for the Community, prepared a delicious meal in the wonderful Italian tradition. In appreciation to the nuns for their gracious hospitality, the artist and his colleague presented the Community with a beautiful portrait drawing of the Prioress, Mother Domenica, whom Roseman had drawn in meditation and prayer in the chapel. 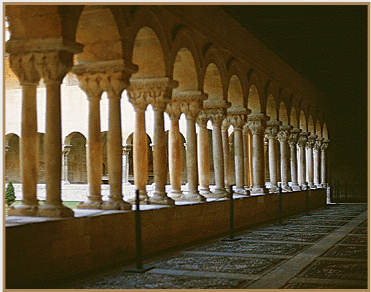 to Stanley Roseman and Ronald Davis, 1999.
of the loggia with Romanesque arches. and for your precious friendship. We are near to you and always remember you in our prayers. 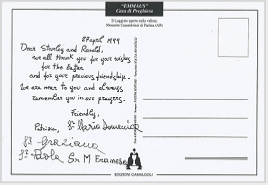 Roseman and Davis kept in correspondence with the nuns, who responded in kind, as with the thoughtful card shown here, (fig. 10). On a return to the Netherlands, in 1984, Roseman and Davis were invited to St. Lioba Klooster, a community of Benedictine nuns in Egmond-Binnen, near the coast of North Holland. Drawings from St. Lioba Klooster, as well as drawings of monks from the Benedictine Abbey of St. Adelbert and the Trappist Abbey of Sion are presented on the page "Monastic Journey Continued," Page 2 - "Returning to the Netherlands." St. Benedict's sister St. Scholastica, a pious woman regarded as the first Benedictine nun, believed strongly in the power of prayer, as related by Pope Gregory the Great in his Dialogues, Book II, an account of the life of St. Benedict. From the early Benedictine centuries, women religious occupied an important place both spiritually and intellectually in monastic life. Today, Benedictine nuns continue to be a vital presence in the centuries-old contemplative tradition in the Church. In this superb drawing, Roseman conveys the inner calm of a middle-aged woman who has devoted herself to the contemplative life. A peaceful countenance illuminates the face of the Benedictine nun, her head inclined, and her eyes lowered as she prays. Brother Ole, the gardener at St. Adelbert Abbey, near the coast of North Holland, is depicted in choir in the eloquently expressed drawing Brother Ole kneeling in Prayer, (fig. 4). The Benedictine monk, born and raised in Norway, where he worked on his family's farm, came to the Dutch abbey to follow a contemplative life. 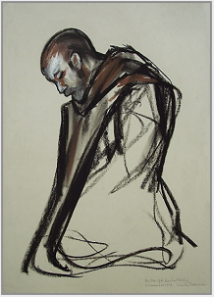 The drawing of Brother Ole, who kneels in a gesture of supplication, head inclined and eyes cast downward, conveys a compelling image of a monk absorbed in prayer. "With my best wishes, Yours sincerely,"
In the year 1980 that commemorated the 1,500th anniversary of the birth of Saint Benedict, The Times, London, published a laudatory review of Stanley Roseman's work on the monastic life. 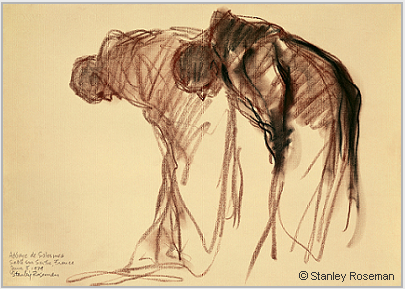 The drawing Two Monks Bowing in Prayer, Abbey of Solesmes, in the collection of the National Gallery of Art, Washington, D.C. and presented at the top of the page, was featured in the review in The Times. The review also presents Abbot Egidio Gavazzi, Abbey of Subiaco, (fig. 2, above); and Brother Alberto, the Cook, a drawing that depicts the monk at work in the kitchen at the Cistercian Abbey of Poblet, in Spain, in the summer of 1979. 1. J.-M. Berland, Saint-Benoît-sur-Loire (Paris: Nouvelle Editions Latines), pp. 6-7. &Todd, 1980), pp. 158, 159. Bibliothèque Nationale de France, 1996), p. 10. 5. Charles Homer Haskins, The Renaissance of the Twelfth Century, (Cambridge, Massachusetts: Harvard University Press, 1982), p. 71. Pope Gregory the Great, Dialogues, Book Two (Collegeville, Minnesota: The Liturgical Press) pp. 67-70. 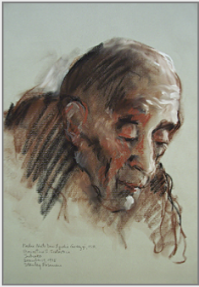 Roseman has created a work expressing deep interiority in this portrait of a man in his middle years who is dedicating himself to the contemplative life. Benedictines have a centuries-old association with books, and scholarship and literary work continue to be an important part of Benedictine monasticism. Through the hospitality of monastic communities, Roseman came to know many monastery libraries. The artist often sought the library as a place in which to draw, as well as for research and study. Quoted here are brief excerpts from a text Roseman wrote on monks, books, and monastery libraries. ". . . From the sixth to the twelfth century, copying and illuminating manuscripts became an important work in monasteries, and many monastic scriptoria were leading centers of book production, on both religious as well as secular subjects. . . . Returning to St. Adelbert Abbey in 1982 and taking up his paper and chalks again, Roseman drew the work presented here, (fig. 7), entitled Brother Thijs in the Library, which was acquired for the renowned collection of master drawings at the Albertina, Vienna. "In addition to books that a monastery produced for its own use and the purchase of books by an abbot or abbess, monasteries received donations of books from benefactors, from guests, as well as from those who entered the monastic community. Many modest holdings of books, once kept in alcoves or cupboards in cloisters or abbey churches, grew to become outstanding collections. As the distinguished Harvard University Professor Charles Homer Haskins notes in The Renaissance of the Twelfth Century: 'a monastery without a library is like a castle without an armory, ran the saying of the time (claustrum sine armario est quasi castrum sine armamentario).' "
Roseman knew well the library at the Dutch Benedictine Abbey of St. Adelbert from the artist's first sojourn at the monastery in 1978 when he met Brother Thijs, the librarian, who was of great encouragement and assistance to the artist in his early research and studies on monasticism. The impressive drawing is rendered with a harmonious interplay of lines and tones of chalks on gray paper. In the gray northern light of the abbey library, the artist drew the Benedictine monk seen here in profile and absorbed in his reading. Brother Thijs' ivory complexion, his dark hair, and long beard give the monk an appearance consistent with his erudition as a Biblical scholar. Presented here, (fig. 6), is the superb Portrait of Frère Augustin in Prayer. 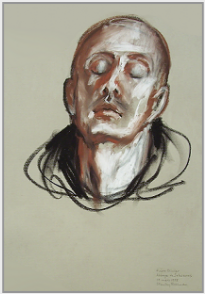 Roseman's sculptural modeling of the head-and-shoulders portrait in black, white, and bistre chalks on gray paper complement the strong, facial features of the French Benedictine monk. The dramatic composition is drawn with bold diagonals and vigorous strokes of black chalk that describe the monk's scapular and hood, lowered to his shoulders. The direct illumination intensifies white highlights and warm shading on the monk's face, with downward gaze and head inclined as he prays. In the present work Roseman employs the compositional element of the triangle, with its Christian symbolism. Broad, vigorous strokes of black chalk describe the monk's scapula and hood in contrast to nuanced lines that define the tunic. Blended passages of black and bistre chalks and reserved areas of the gray paper give tone and sheen to the monk's black Benedictine habit. Sister Paola at Vespers, (fig. 9), is exemplary of Roseman's skillful use of the medium of chalk with a harmony of line and tone. The woman's sensitive face, seen in three-quarter profile, is beautifully rendered with warm shading in a combination of chalks, heightened with white. An economy of fluent lines in black chalk describes the veil and habit and gives the drawing a lyrical quality. The face of Brother Ole, seen here in profile, is finely rendered in a combination of black and bistre chalks with the addition of white chalk imparting cool highlights to the warm skin tones and texture to the monk's closely cropped beard.